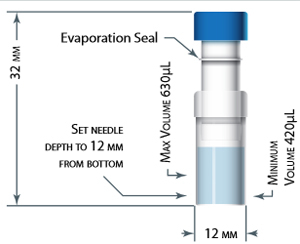 Thomson eXtractor3D|FV® Filter Vials (patented) offers filtration with increased volume enabling multiple extraction techniques with different resins/sorbents or solids/large particulates (heavily laden) to autosampler ready vials. eXtractor3D|FV® is a product uniquely designed for the addition of resins/sorbents, QuEChERS dispersive salts, pills, or special resins in the standard autosampler ready vial. The filter vial consists of two parts: a filter vial shell and a plunger which includes a multi-layer filter on one end and a low evaporation screw cap on the other end. Large solids/large particulates can be placed within the eXtractor 3D® where multiple extraction techniques occur. Prior to the introduction of the eXtractor3D|FV®, samples required multiple steps using SPE, or other methods to remove interfering analytes and co-eluting compounds. SPE or Quechers can now be completed with multi-depth filtration without risk of solids compromising the autosampler. Pills and other large solids can be broken down for complete testing using the eXtractor3D|FV®. eXtractor3D|FV® allows for compounds to be separated from the matrix with the addition of resins/sorbents, resulting in both a higher signal to noise ratio and peaks that are more differentiated.